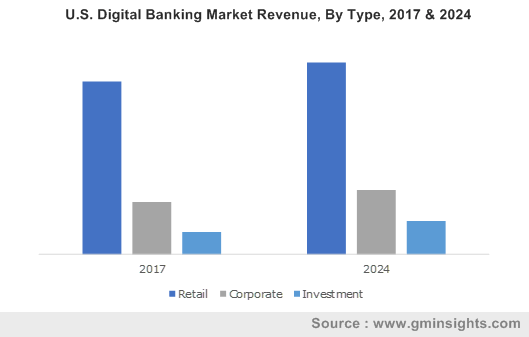 The fact that online banking market is one of the most rapidly growing financial business verticals has been underlined by the robust consumer banking trends in recent times. For instance, the consumer banking segment of Bank of America depict commendable growth in the final quarter of 2018 and is expected to continue doing so in the years to come, moderately impacting the overall online banking industry. Indeed, Q4 2018 saw the Bank of America registering 26.4 million mobile banking users and 36.3 million online banking users. Of all the Consumer Banking sales, 27% were digital sales and 49% of all digital sales came from mobiles. Besides the conveniences offered by online banking, the large millennial population is also helping to add impetus to the online banking industry growth. Estimates show that millennials make up for nearly 83 million digital users who prefer to use digital bank channels to carry out their transactions and being the most recognized demographic segment in the current economic sector, their activities have become a major avenue for the growth of the online banking market. Since the online banking industry has come to hold significant promise for further expansion in the future, investment in online banking has been pouring in rapidly in recent years. For instance, Cogni Inc, a lifestyle banking startup based in New York, recently raised $1.7 million seed funding as it prepares to launch. Cogni Inc basically aims to be a single payment and commerce platform which will hold deposits for consumers and book their hotels, flights and movie tickets. Such models have been highly successful outside the U.S. Significantly, 2% of Cogni is owned by Barclays, one of the largest and most recognized investment banks in the world. Experts opine that in the recent years, online banking has been creating one milestone after the other with new players entering the online banking market and thriving within a short period of time. Two of the leading European digital banks, namely N26 of Germany and Revolut of UK have 2 million and 3.3 million customers respectively and as they prepare to make their debut in the U.S. in 2019, they are anticipated to garner significant number of customers there as well. One of the features that has made easy for these banks to gain such as huge number of customers is the simplicity of opening an account. Digital banks are easily winning the competition against brick and mortar banks to win customers as they let customers use only the mobile phone to open an account, that too within only a few hours. The advent of mobile phone technology has its own role to play in the expansion of the online banking as the tech savvy millennial population, who are also poised to become the leading force in the banking industry, have been found to use their mobile phones to access their financial institution more than 8 times in a typical month and their common activities involve checking account balance, transferring money between accounts, checking recent transactions and receiving notifications from banks. Online banking trends suggest that customers, millennials and non-millennials alike, are increasingly adopting to the ease of mobile banking and thus driving the online banking market further. Financial institutions are coming to notice this trend for online banking of branch-based banking falling behind mobile banking and some of the heavy-weights in the banking industry have decided to shut down branches while adding to their array of online banking solutions, which has added a further impetus to the online banking market. For instance, Bank of America has cut off numerous branches as it registered that visits to brick-and-mortar branches can be reduced by 33% if focus is instead turned to online banking solutions such as mobile, online and ATM services. In fact, Bank of America’s virtual AI assistant, Erica, attained a resounding success soon after its launch when it was recorded that nearly 4.8 million users had 23 million interactions with the chatbot. Such reconsiderations for necessity and cost-effectiveness of physicals branches that are attracting lower number of visitors are causing banks to become more tach savvy and less traditional. Instead, they are more inclined to use the subsequent budget surplus that is created by closing branches for improving their mobile apps. One of the biggest motivators for banks to turn to online banking services is possibly the fact that digital and mobile banking has been found to improve customer satisfaction and loyalty by a wide margin. Customers who have experience high mobile banking satisfaction have been found to recommend banks providing such online banking services to others as well as reuse the bank’s services for other transactional activities than customers who use banks without an app services or do not use banking apps. Consequently, experts suggest that the online banking market will witness a potential surge and surpass $9 trillion by 2024.